So a coffee maker was soon purchased. Eventually in January or so I came down with my annual (or biannual) cold — I don’t get sick much. So I switched from coffee to tea and started digging deeper into the tea collection that a friend had sent me from Stash Tea. I quickly found that my favorite hot tea was orange. And then earlier this month when I visited Chinatown in NYC, we stopped at Ten Ren for Chinese tea. I haven’t tried those flavors yet. I just remember ginger tea and oolong tea. And finally, for my birthday, Roger and Marco got me the Dutch blend shown above from Pickwick tea. I didn’t realize that way back when, the Dutch were the first to bring tea into Europe through the East India Company. 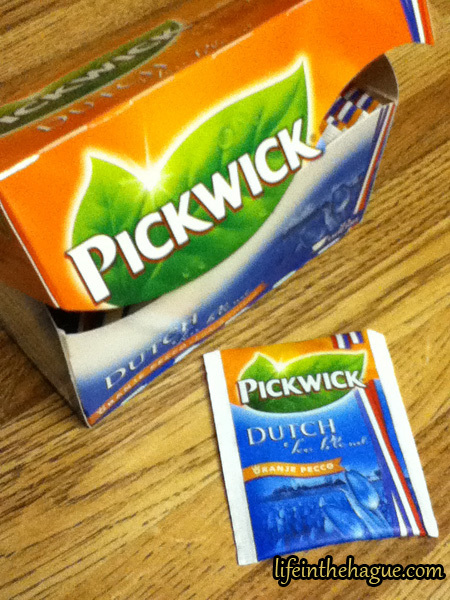 The above tea from Pickwick is what that company considers a “good representation of the country” – the orange is a nod to the house of Orange-Nassau. Apparently it was developed partially with opinions of Hyves users (Hyvers being the Dutch equivalent of Facebook).